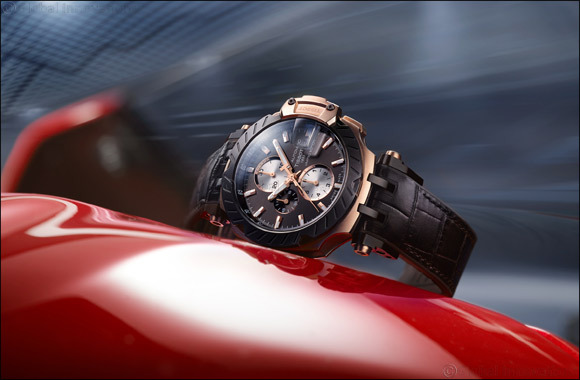 Dubai, UAE, March 26, 2019: The Tissot T-Race MotoGPTM Automatic 2019 features a special design with a black ring made of carbon fibre, a tough, sleek material that is highly resistant. It highlights some resistant pieces of the motorcycle. The impressive technical achievements which lay at the heart of Tissot can be viewed through the caseback; resembling a wheel, which lets the movement be easily admired. Sporty can be elegant, as the luxurious detailing on the Tissot T-Race MotoGPTM Automatic 2019 proves. A tasteful dial features counters and bigger indexes in a refined rose gold colour, while a complementary case in PVD rose gold looks cool with a black coated PVD bezel. The strap is in keeping with the discerning theme, with resistant rubber coated with imitation crocodile leather, adding a classic dimension to what is set to become a classic watch. Fans of both sport and style take note: it is only available in a limited edition of 3333 pieces.